Paul Scholes. Jamie Carragher. Gary Neville. Matt Le Tissier. Tony Adams. Trent Alexander-Arnold? The one-club player is something of a rarity, but Liverpool's golden kid has big ambitions on Merseyside, and on early form you wouldn't bet against him achieving them. 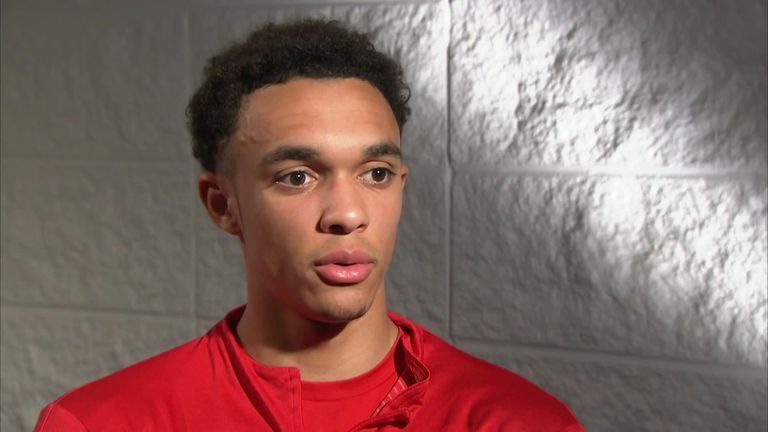 So does Trent Alexander-Arnold want to emulate Jamie Carragher, synonymous with Liverpool and Liverpool only? "Yeah, definitely," he tells Sky Sports. "To play for Liverpool is the dream, the aim, and I can't see it changing to be fair. As long as possible I want to have that relationship with Liverpool, to be a Liverpool player. "To say I have done that for the whole of my career is something I have dreamed of being able to say." The 20-year-old's 2018 has provided moments of pride, but not necessarily celebration. 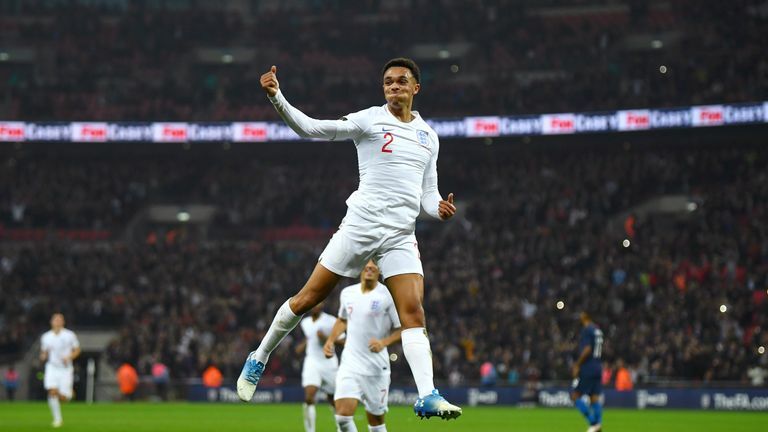 A Champions League final appearance and a World Cup finals appearance, not to mention a first England goal and several accolades including a shortlisting for the Golden Boy award alongside Kylian Mbappe. But 'appearance' is the key word. "The words: Champions League final, it's not Champions League winner, which brings that extra motivation," Alexander-Arnold says. "It's something you've got to be proud of. It always still hurts when you think how close we got to winning something big, and you only got the silver medal. "The words: Champions League final, it's not Champions League winner, which brings that extra motivation." "It's something that is tough to take, but again you learn your lesson from it and you try to take things from the game. You try to use it to get better and that's what we've tried to do this season, look back on what we did wrong and how we can be successful. "It was tough to take, and you just want to get back into those games, into another final and to try and win it this time." Jurgen Klopp's Liverpool have entertained since his arrival in 2015, but the German is in slight danger of being remembered for top-four finishes and final disappointments. Trailing this Manchester City side by just two points after 12 games is no mean feat, but how can Liverpool turn entertainment into silverware? Alexander-Arnold insists they're not here just to have fun, and short-term focus is the key. "We're still in three of the competitions, so we'll aim for all three of them, but we're not just in them to have fun, put on a show, we're there to win," he says. "We're not a team that likes to lose or even likes to draw. Every game we want to win. We're not just here to have fun, put on a show, we're there to win. "You know it would mean a lot to the fans if we did win the league. We want to do it, everyone wants to do it in their career, but it's important to stay short-focused, focus on the next game, because that's what is going to stop you, one bad result. "At the end of the season if you miss out by one point you will look back to where you went wrong, and that could be a game in October that you should have won and only got a draw. "The best chance we have of being successful is to not slip up and keep working hard to get three points on the board." Squad depth, Alexander-Arnold says, will also be pivotal. Liverpool added four players in key areas in the summer, as well as Virgil van Dijk in January, and have utilised the full squad. "The club brought in quality players. There's a lot more squad depth, and there are world class players all across the pitch. Looking at the season so far, there have been a lot of rotations," he adds. "It's not just going to be 11 players that are successful, it's the whole team, it's 20, 25 of us that need to play our part and need to keep the momentum up."